first things first - the trip to utah. on saturday morning, david and I woke up at the crack of dawn (no, before that) to get a head start on our trip. we spent about 15 minutes at the gas station trying to figure out how to open the gas tank on christian's car. we then experienced several head jerks while david worked on becoming a pro at stick shift . . . I'm still waiting for that to happen. it sure is hard getting used to a different car's bells and whistles. all in all, I loved being stuck in a small vehicle with my dearest love for over 10 hours - junk food and all. once we arrived in provo, we headed straight to cjane's retro house. boy howdy is it retro . . . and even more amazing than I thought. the kitchen has cold cheese quesadillas on lunch plates, scooters being raced around the green room and lots of love. I can't count how many times I heard courtney say, "oh jane, I love you" and "oliver, you are so cute". that house is bursting with positivity, jokes and love - a perfect anecdote for christian and the children. and everyone else for that matter. david and I stayed with some friends of ours - like we always do. they are so very nice and always welcome us into their home. 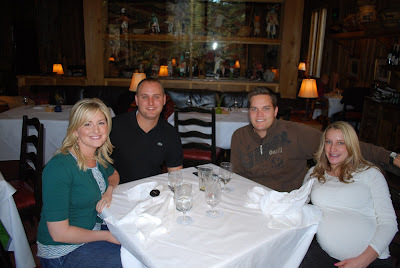 we tried to have dinner at one of our favorites places in park city, cafe terigo. it was majorly sad to see the "closed" sign hanging out on the front door. the next day, we went to sundance for brunch which is always a pleasant experience. we ate too much and took some awesome pictures. can you tell that aubrey is a little pregnant? just a little. we also got some great shots for our christmas card pictures - but more about that on another day. I got to hang out with the kids for two days in a row. it was so great. I walked into the house and gigs immediately ran to me with lots of whistling and gabbery words about scooters and trail mix - I suspect that's what he meant anyway. I'm just thrilled he remembered who I was. whew! after david left on sunday night, I headed over to pleasant grove to see m and her husband. I went to courtney's house for more time with the kids while m was at work. m & s made delicious whole wheat pizza for dinner that night and then we played a little guitar hero and made a napoleon dynamite prank call to david. i haven't laughed that hard in a looooong time. unfortunately, he didn't think it was as funny as we did. on tuesday, I went to courtney's house for more time with the kids while m was at work. christian and I took a lovely walk down the street to see the renovations of their soon-to-be house. steph is going to seriously love it. after courtney treated me to some ice cream from the byu creamery (cookies & cream to be exact), I said a sad goodbye to the children before m came over to pick me up. we went to gloria's little italy for lunch (a your heart out recommendation) and it was good. I only wish I could have eaten the prosciutto and cantaloupe appetizer ($15 was a little steep for a lunch appetizer). too bad - so sad. then we went back to m's house to pick up steve and head to salt lake. after a little bit of shopping, we went to cafe trio for dinner. butternut squash ravioli, creme brulee and amazing chocolate pudding . . . so good. this picture of me is so not good, however. but I heart cafe trio. then to the airport and back home. I missed that david of mine. love your blog, thanks for sharing! total blog stalker here. Just had to say that I went to Cafe Trio over the weekend and also had the Creme Brulee. So so good!! in your etsy store which i looked at a little while ago: did you paint that kind of contemporary painting of a 'flower' with slashes? it seems so different from your other work. i'm jealous of your talent. i couldn't paint my way out of a corner without making a huge mess. i'd love to hear about christian and stephanie's house/renovations (one of my fav topics - remodeling, etc) but i know, that's not your story to tell. glad you got to spend time with your family and neices and nephews and now you have a the dog! Your like is about 100 times more exciting than mine. Maybe we should be friends and your excitement could rub off on me. That sounds like a fun trip! I especially loved the part where you said Gigs immediately ran to you and gabbered about scooters and trail mix! ha ha. That was funny! I miss your face! Lets get together soon! oh Lizzy that was SO fun to have you here! Thanks for all of the good outings. And I must say that everyday that I see Christians car across the street, I immediately think that you are there! Also, you'll hear all about the house renovations someday. Let's hope you hear it from Nie Nie! ok I am such a silent stalker. 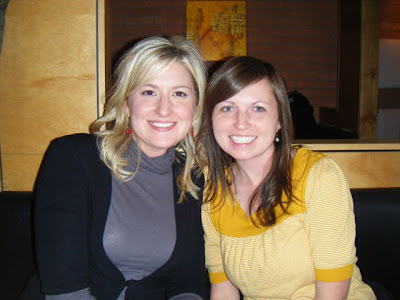 Love your blogs and commentary! Hello!! I love your blog. I have a question...who did your header thingy? 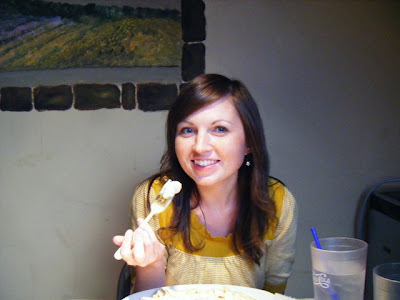 I am kind of new to the blog world - LOVE IT by the way - and want my blog to be super pretty, too. Thanks...any help would be fabulous! Thanks! I actually made my header. I used to be obsessed with making new headers because I could never settle on one that I really loved. Now I have. It's nothing fancy. I just create it in Microsoft Word and then copy it to Microsoft Paint (only if it needs some extra tweeking which the 2007 version of Office has now) and then crop it in Picasa (a FREE and awesome tool for editing pictures). It's not hard. It just takes time. You know, I think I'll do a tutorial on it since a lot of people have been asking. That was a good weekend. Thanks for sharing. I heart Cafe Trio too. The ravioli is my fave.